Mighty Mac is the most unusual engine on the Island of Sodor. In fact, he is two in engines in one! When Mighty and Mac work together, they are the strongest engine on the Island. But when they pull this way and that, they only end up where they began! 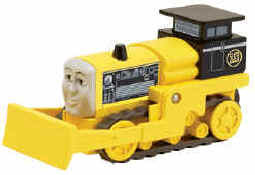 Byron is a giant bulldozer capable of moving tons of dirt. His size, strength and skills are very impressive...and he knows it! He doesn't like to waste his talents on jobs which he thinks are beneath him in importance. 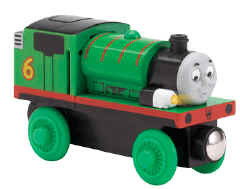 This deluxe version of Percy brings him to life like never before! Push the button, and hear Percy's' classic "peep peep" sound. Push him along and hear him "chug chug" his way along the tracks. Also features working headlight. Requires two button cell batteries (included). 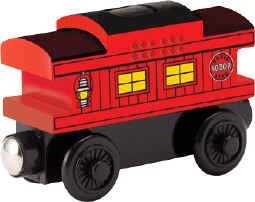 Little engineers can now enjoy playing the Thomas & Friends theme song while recreating their favorite stories.. When you push the button, the Thomas & Friends theme song plays and the interior light shines! Requires two button cell batteries (included). 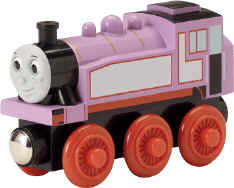 Rosie is a feisty, fun and very free spirited tomboy tank engine who idolizes Thomas, copying his every action and mood. This drives Thomas crazy, as he just wants to be left alone to be Really Useful. But why, thinks Rosie, can't they be Really Useful together?! As seen in "Thomas and the Birthday Mail" story. Daisy is a classy, sassy passenger diesel. She believes she should only carry passengers and never pull trucks, though she soon learns that all work is important and now helps out whenever she can. 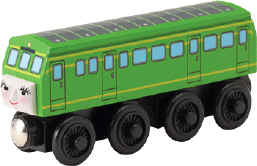 She can be seen in "Thomas Meets the Queen" video. This new and exciting addition to the Thomas line plays a "moo" sound when a little engineer slides the side door open to see the cow. Includes milk cargo car with removable milk barrel. Two button cell batteries required (included). Derek is a kind and helpful engine. 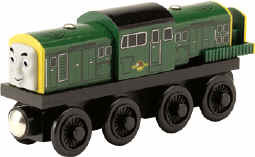 He was able to convince Bill and Ben, after helping them at the Brendham Docks, that not all diesels cause trouble. He can be seen in the "Double Teething Troubles" story. We are located just North of Subway in Avon next to Studio 12. 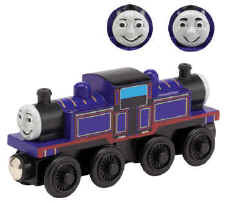 Our New store is 3 times as large and offers the LARGEST Selection of Thomas the Tank Engine within 500 miles. Store Location: Avon Village just North of Subway, Sound Side.